With over 30 years of experience, Cell Technology has been able to accomplish a lot. Thus, our prestigious clients can vouch for our restless desire to be innovative leaders in our field. With that said, we’re using Antibody-Dependent Cellular Cytotoxicity as a crucial pre-clinical step in the pharmaceutical industry. But, what does that mean exactly? First, ADCC is a machine of a cell-mediated immune defense. This means that it can strategically pick out a cell that has been bound by specific antibodies. For the pharmaceutical world, this is great news. Secondly, this means more research can be done on immune systems. In this way, we’re using ADCC to determine “the activity of the antibody and/or complement against specified target cell lines.” As such, we have an assay platform that we can mold. Therefore, it can select antibody drug candidates. To learn more, visit us online. In medicine, finding an organism that is indicative of a disease or infection is a crucial part of science. This is the biomarker, the measurable substance that allows for these mysteries to come to light. Acetylcholinesterase (AChE) is a type of enzyme that is commonly used as a biochemical catalyst. It uses water to break a chemical bond. The result is a breaking of larger molecules to smaller ones. Our Flouro AChE Detection Kit can monitor multiple time points to follow kinetics with non-radioactive assays. In this fashion, the enzyme is able to measure the effect on the nervous system following exposure to pesticides. Because it’s so sensitive, it has become a great source of measurement. Scientists are still researching new ways for this biomarker to become useful in the future. Notably, it can make big strides in the world of environmental and occupational human health monitoring. As a continuation of our talk on oxidative stress, another solution that we have at Cell Technology is the Hypochlorite Detection Kit. This, of course, is the toxic side of oxygen and metabolism. Hence, a reason for us to want to detect it in our bodies. When your body is responding to an infection, it signals the immune system to produce small amounts of hypochlorite. This happens within the white blood cells. Simply put, they engulf viruses and bacteria and then digested. Here is how the kit works. Aminophenyl fluorescein (APF) and Hydroxyphenyl fluorescein (HPF) are able to detect any highly reactive oxygen species (hROS). So, when you use both of these probes together, you can detect hypochlorite production in cells. The hypochlorite can be detected by loading two different. One with APF, and the other with APF. Thus, you can tell if there are any hypochlorite being produced. f there’s an increase in fluorescence of APF loaded cells and no increase in the HPF loaded cells. Superoxide dismutase (SOD) is an enzyme found in all living cells. This enzyme, in particular, catalyzes the dismutation of superoxide radical into hydrogen peroxide and molecular oxygen. Consequently, this becomes an important defense mechanism against superoxide radical toxicity. Oxidative stress that is dependent upon superoxide radical can account for a number of acute and chronic disease states. Hence, using the Superoxide Dismutase Detection Kit. This question is important for why we would want to detect these levels in the human body. Oxidative stress refers to the toxic side of oxygen and metabolism. Consequently, it’s the imbalance of oxidants and antioxidants. As Professor Helmut Sies has noted in his research, this leads to disruption in redox biology. This imbalance and “stress” evokes biological stress responses. 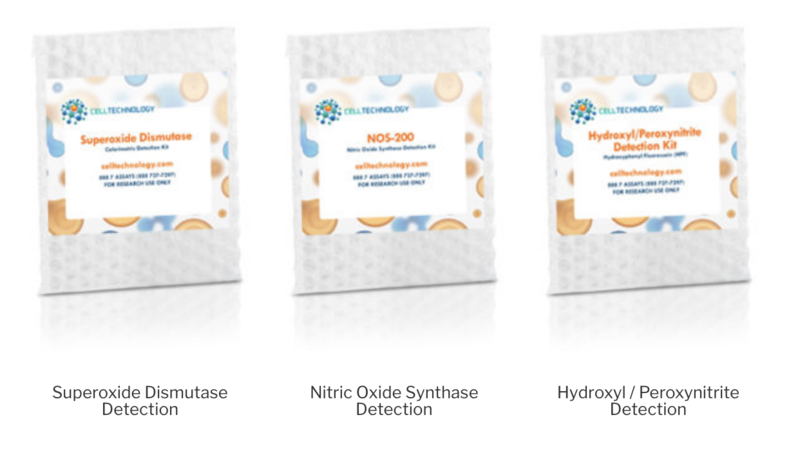 Cell Technology’s Oxidative Stress Detection Kits, such as the Superoxide Dismutase Detection Kit, is a way to protect against apoptosis. Contact us for more information. Did you know that you can quantify Sarcosine samples with Fluoro Sarcosine? Sarcosine, a protein component plays an important role in the metabolic activities of living cells. It is a constant source of serine, creatine, and purines. Sarcosine is a natural amino acid which is an important intermediate in the metabolism of choline. Known to activate prostate cancer cells. Cell Technology finds a way to quantify sarcosine in biological samples. Cell Technology’s Fluoro Sarcosine assay provides a reliable fluorimetric method for quantification of Sarcosine in biological samples. The detection kit utilizes a non-fluorescent detection reagent. The main benefits are that it’s easy to use and detects sarcosine in cells, tissues, and serums. It is a new and reliable breakthrough in medical science. Enzyme-linked immunosorbent assays, or ELISA Kits, are useful tools in the medical field and the research field. They detect the presence of antibodies in a sample. In the body, when an antigen or harmful substance is present, the response is to produce antibodies. The antibodies then to work warding off the antigens. ELISA Kits work by detecting these antibodies and thus identifying what antigens the body is currently trying to fight off. In the medical field, ELISA tests can be useful in identifying all kinds of diseases. These include HIV or AIDS, syphilis, Lyme disease, Rocky Mountain spotted fever, and many more. Surprisingly, they have wider applications, too. For example, ELISA tests are useful in the food industry to detect potential food allergens, such as milk, nuts, and eggs. 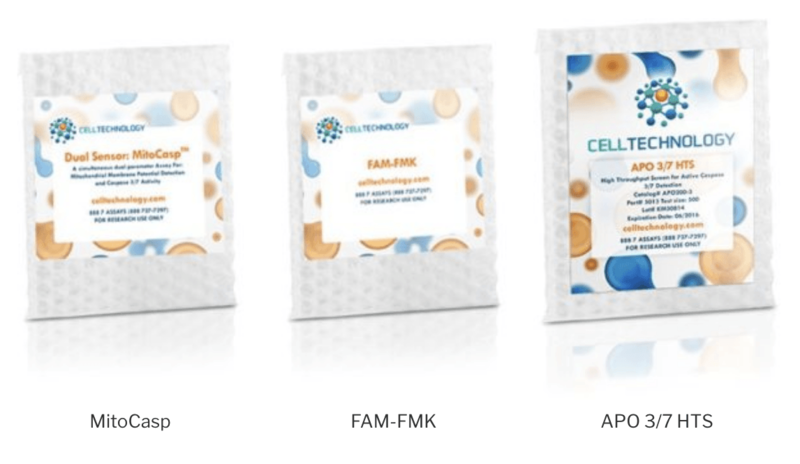 At Cell Technology, we offer a variety of ELISA Kits to assist the academic, biotechnology and pharmaceutical industries in their studies. When levels of reactive oxygen species increase to dangerous amounts, it is known as oxidative stress. Further, this may be from environmental stress occurring outside of the body, like UV or heat exposure. When the body is in this state of stress, important cell structures can be damaged. When cell systems are functioning properly, reactive oxygen species (ROS) are a natural byproduct of metabolic reactions that break down oxygen. Thus, this process results in ROS like peroxides and superoxides. These then serve important roles in homeostasis and cell signaling. Eventually, high or prolonged oxidative stress may play a part in serious medical issues. For example, these include cancer, Alzheimer’s disease, heart failure, and much more. Therefore, it’s very important to detect this stress early and work in neutralizing these high levels of ROS. Because of the crucial nature of early detection, at Cell Technology, we offer several different kits for detecting increased ROS. Metabolism comprises a group of life-sustaining interactions happening at all times in the body. Moreover, this process contains two separate categories: catabolism – processes that break down, and anabolism – processes that build up. Each process, while entirely necessary throughout the body, can become problematic when overactive or underactive. Therefore, it is crucial, even absolutely necessary, to monitor the levels of metabolic activity in the body, as these levels can indicate the presence of serious disease. Thus, metabolic assays do just that. Monitoring diseases with metabolic activity. Metabolic assays work in a variety of ways, each individual to the specific metabolic pathway that is being monitored. For some, such as NAD, NADP, and Sarcosine – the assay uses cells and tissue extracts to determine the levels of these molecules. In effect, this is important for the detection of lipid synthesis and the activation of prostate cancer cells. In others, such as Cholesterol, Lactate, and Phosphate – metabolic assays use plasma or blood samples to determine the levels of the respective molecules. Further, these levels can lend knowledge about the presence of diseases like diabetes, lactate acidosis, and various cardiovascular diseases. Accordingly, we offer a wide selection of metabolic assays for the early detection and monitoring of various diseases. Find our products here or learn more about our company. Apoptosis – cell death – is an incredibly common and important part of the cell life cycle. In fact, for an average human, approximately 25 billion cells undergo this process in the body every day. However, cell death may happen for unnatural reasons as well. Overactive apoptosis sometimes occurs during certain viral infections such as HIV, prompting an imbalance in the number of cells dying versus the number of new cells growing. Because of this, it’s imperative for scientists to have a way to detect and track instances of cell death. They do this with caspase assays. In the beginning stages of cell death, certain enzymes called caspases are activated. These caspases play an integral part in the death of a cell, as they act as initiators of the entire process. Upon activation, caspases act by cleaving a specific protein substrate (called PARP) that signals the disassembly of the cell. Therefore, by detecting the live activity of these caspases, scientists can track cell death in real time. At Cell Technology, we offer a selection of Caspase Assays for Apoptosis Detection. Check out our selection here, or reach out today to talk to a trained professional.